Irish Funds Industry Association members enjoy a wide range of benefits directed at increasing their knowledge, networks and influence. View our members directory. As the recognised voice of the funds industry in Ireland we have ongoing engagement with local, European and global regulators and policy makers. Through our close working relationship with the Central Bank of Ireland, all relevant Irish government departments, our involvement with the European Parliament, European Commission and ESMA, and our engagement with global regulators and policy makers like IOSCO and the FSB, we ensure advocacy at the highest levels on the issues that matter to you. The Irish Funds Industry Association clg (Irish Funds) is represented on the board of the European Fund and Asset Management Association (EFAMA) and the International Investment Funds Association (IIFA). We also work closely with many other European and global associations providing a wide representation of our members’ views and positions. With our finger on the pulse of industry developments we provide members with timely industry updates on technical, regulatory and tax issues. You will also receive access to our industry webinars and all the relevant and up to date papers, consultations, submissions and other industry publications via our dedicated information portal. Irish Funds members have access to our members portal with over 1,500 resources available (industry papers, working group minutes and more). By participating in the Association's broad and inclusive structure of 8 steering groups and 40 working groups your organisation can play an active part in shaping all the components that contribute to making the environment welcoming and effective for the funds industry. Our 2017-2018 regulation and policy development activities included more than 250 meetings with local, European and global stakeholders and over 60 written submissions. Irish Funds is at the forefront of regulatory and governance standards for Irish and international investment funds. 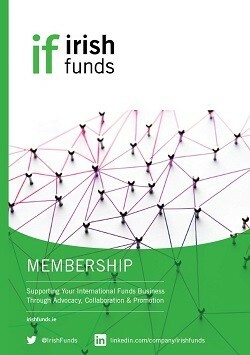 Through the development and publication of white papers, codes of practice, industry consultations and technical guidance, Irish Funds sets world class standards for investment funds. Through our extensive global calendar of events we provide a range of opportunities to connect and share insights with policy makers, asset managers, distributors, technical experts and service providers. In 2017/2018 over 5,000 industry professionals attended Irish Funds events across 16 cities. Participation as a member provides valuable networking opportunities to both meet new clients and enhance relationships with existing ones. Members have priority access to promote their brand via a range of sponsorship opportunities. Through the programmes we support with the Institute of Banking along with industry-specific seminars and briefings, the association actively supports the professional development of those working in the industry. View more about funds industry educational programmes. 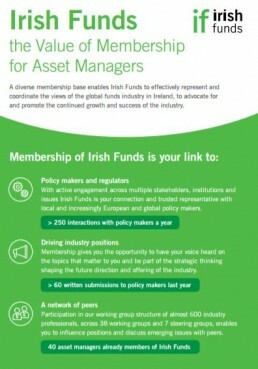 Find out more about the highlights of Irish Funds membership for asset managers.